"Unfortunately I can't guarantee that your pardons won't be enjoined by the Ninth Circuit. Always happens," he said at a White House event Tuesday. 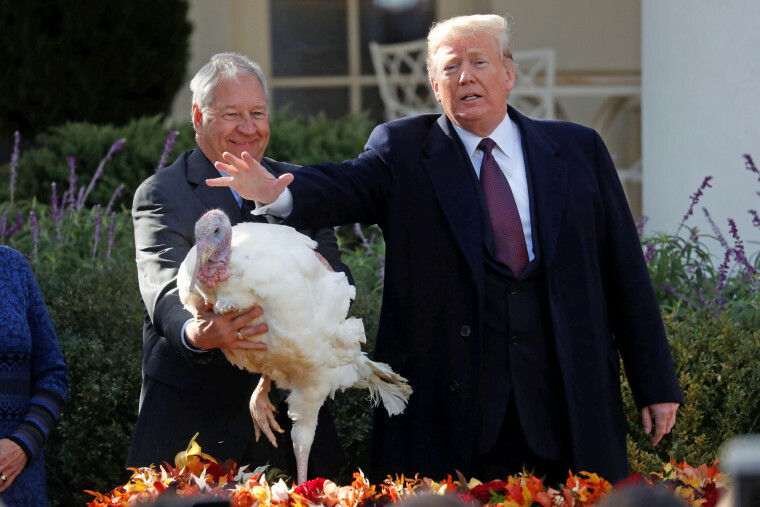 WASHINGTON — President Donald Trump pardoned two turkeys at the White House on Tuesday, his second time participating in the annual tradition. The president, joined by first lady Melania Trump, issued this year’s pardon to Peas, a 40-pound bird from South Dakota, and his alternate Carrots. The winner and the alternate were decided in an online poll. “The winner of this vote was decided by a fair and open election conducted on the White House website,” Trump said at the ceremony in the White House rose garden. Trump has recently made unfounded allegations that severe voter fraud impacted the results of the 2018 midterm elections. Recounts in the Florida gubernatorial and Senate race lasted for more than week after the election. Republicans were eventually declared the winner in both races. Trump also warned the pair to be on the lookout for an investigative push from the incoming House Democratic majority. And despite the pardons, he said, they shouldn't relax. "Unfortunately I can't guarantee that your pardons won't be enjoined by the Ninth Circuit. Always happens." Courts in the Ninth Circuit have, at various times, put holds on versions of Trump's travel bans, his effort to end the Deferred Action for Childhood Arrivals program for individuals brought to the United States without legal status as children, and his push to force tougher immigration enforcement in so-called "sanctuary" cities. “Gobbler's Rest” has housed pardoned turkeys for the past three years, starting with President Barack Obama's final birds, Tater and Tot. The pair was later joined by Trump's first pair of pardons, Drumstick and Wishbone. All four birds have since died.